I love Bulla Ice Cream. They are just so creamy and they have a great ratio of chocolate to ice cream. The flavour options are awesome and I love that you get two flavours in the one box. Bulla ice cream is so very creamy and also delicious and the chocolate coating is good to crunch into and then the taste of creamy sweetness on the inside. The combination of these icecream flavours available together are great as you can please everyone in the family. They are both delicious and creamy in texture. Perfect way to serve dessert. Super soft silky smooth ice cream cover up in a shiney crunchy smooth chocolate they just make your mouth water. I love these ice cream. 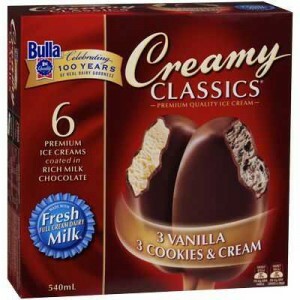 These Bulla ice creams in my opinion are Australia’s luxury ice-cream. They have a nice coating of chocolate on the outside and creamy ice cream in the middle. The kids love the cookies and cream flavour and we like the vanilla – so perfect for our family! These don’t ever last long in my freezer. I love the vanilla and my teenager loves the cookies and cream. Ice cream is always tasty, smooth and has a lovely after taste. A favourite for my husband and I. These are one of our favourites, it’s a nice mix of chocolate and icecream and they aren’t too rich. I love Bulla ice-creams. They are so delicious and smooth. I love the vanilla the maximum ! Its the best dessert to share with friends invited for dinner. I really like these ice creams. Ive given 4.5/5 stars as there would be improvements. I love the ice cream inside. The texture is smooth and creamy and the flavour is awesome. The chocolate is a higher end cheap chocolate. Still yum but could be creamier. Price is great! We often have a packet of Bulla variety icecreams in our freezer, expecially over summer. They are probably one of the creamiest icecreams you can buy. Ice cream and Icy poles are a must have in my house with the warmer weather approaching!!! I nees to try these, they sound delicious!!! How would you rate Bulla Creamy Classics Ice Cream Classic Caramel Vanilla?